The Cuff Case designed for use with Galco shoulder holsters can be worn on shoulder system or belt and is available in tan, black, and havana, right or left-handed. The modular interchangeable component shoulder systems were invented by Galco International in 1969. Today, they continue to offer quality and versatility by developing products that enable you to design the perfect system to suit your needs. For example, you may assemble a two-handgun rig, a half harness system, or add tie downs and cuff case to an existing system. The possibilities are endless. Could not have been a better fit for hinge cuffs. 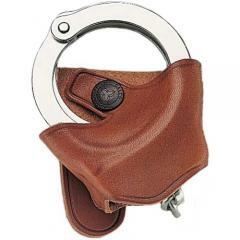 Great handcuff case for non hinged cuffs. Wished the case would carry the hinged cuffs easier.